The Jobs-to-be-done approach is a very simple, yet hard approach for getting to the root customer insight in order to improve your products. With the approach we are saying that customers buy products because they have a job to do in their life and they hire products to help them do this job and achieve a certain outcome. But, as the approach is simple it is also easy to end up with superficial solutions. The problem I am working on is: How to design a simple model forcing workshop/team participants to dig deep down and find the root causes for customer behavior. Combining several different approaches, most notably Ding and Sum (4) with the approach used by Mark Johnson (3) I have pulled together a simple model that so far has proven effective. 1. VERB: What is the core defining verb of the customer’s job? 2. OBJECT: To what object is the customer trying to do the verb? In faireness, I often articulate the job as a sentence first and then work on it in order to distill it into the model. I found that the point of designing it into a verb and an object is that it forces additional simplification and clarity. Distilling the job into a verb and an object is an approach by Ding and Sun (4). I used to apply a more UX based approach asking “As a… I want to… so that I can…” But this often produces functional descriptions and excludes important elements from the equation. Using verb and object my job-definitions become more human and motivational. 3. CONTEXT: If context provides clarification or modification, then it should be written in here. 4. 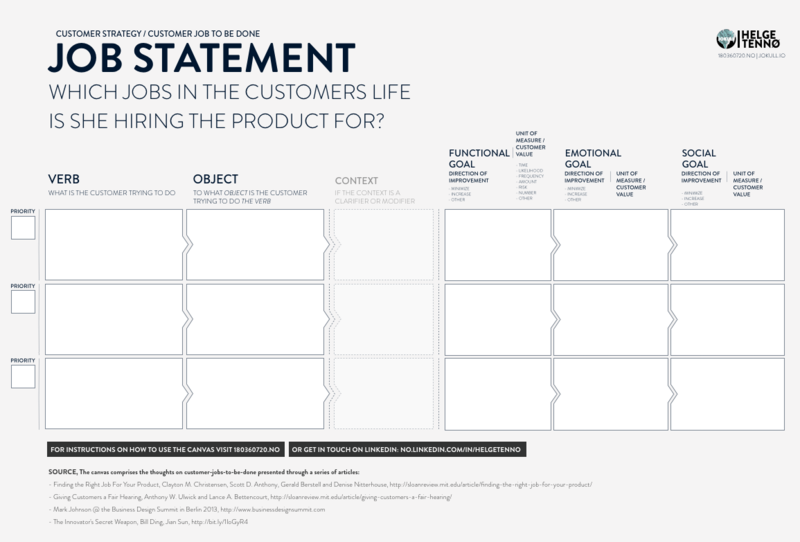 FUNCTIONAL GOAL: What is the customer’s desired functional outcome? This is often the first job that comes to mind when thinking of what the customer will hire the product for. As an example: If I’m just hiring a hotel because I’m travelling and need some sleep then the functional goal would be to get the best possible rest and likely the least amount og hassle and friction. In the model I have included Direction Of Improvement and Unit Of Measure as a guide – based on Ding and Sun(4). I do not always use these myself. 5. EMOTIONAL GOAL: What is the customer’s desired emotional goal? As an example: If the context is a romantic escape I would hire the hotel to make sure we get some private time together and the goal would be to increase the quality of the time together. 6. SOCIAL GOAL: What is the customer’s desired social goal? This is the outcome customers are seeking in relation to their networks. Be it family, friends, work or other. As an example: If the context is a weekend trip with twelve friends to catch and meet up, I would hire the hotel to work as a hub for the group. The social goal would be to avoid confusion (twelve people is a lot to coordinate), share experiences and enjoy each others company. 7. PRIORITY: If needed priorities the jobs in accordance to each other. Previous Post Technology will disrupt. Why, what and how? Hi Helge, great job! But do you have any examples on how you would fill out the canvas? thank you for sharing your know-how with us. your website and blogs looks great and the knowledge up to date and beautifully crafted.